Here it is: my final update on the status of the most popular presidential forecasting models. On the top are Nate Silver and Andrew Tanenbaum; on the bottom are Sam Wang and Josh Putnam. Three of the four have moved a bit in Obama’s direction since yesterday, and all four models continue to predict a convincing Obama victory. 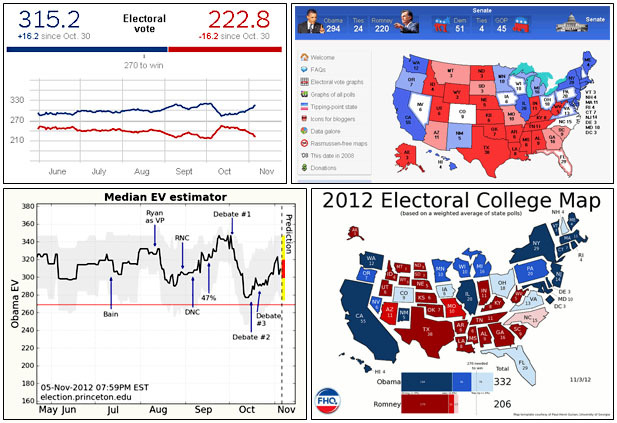 The average forecast is 312 electoral votes for Obama vs. 219 for Romney. So that’s that. On Tuesday, the most consequential election in the history of Western civilization, pitting a radical socialist revolutionary against a misogynist plutocratic reactionary, will finally be over (God willing). On Wednesday, the backbiting and sniping will begin. Then, after a long weekend to cool down, we’ll all start prepping for the next most consequential election in the history of Western civilization, the one that will determine the character of these United States for decades to come. I can’t wait.